This featured estate home is one of Klein’s Landscaping most innovative projects. We feature on this project many of our custom designed elements such as fountains, concrete countertops, stamped concrete, pool decking, acid stained concrete, gas fire pits, and much, much more. The Most Innovative Marketing Concept in Outdoor Living and Landscape. Operation Outdoor Living is a mobile showroom ready to go where no outdoor living showroom has gone before. This state of the art mobile showroom is not only a great new way to advertise, it's a step above the competition. 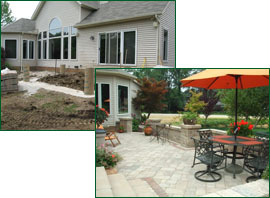 B.T Klein’s Landscaping is guaranteed to give you the most innovative designs and solutions for your landscape and construction needs. B.T. Klein’s offers exciting design experiences that are unlike any other company. We offer a full range of ideas and solutions to guarantee you get the most out of your investment. We will make sure our designs and solutions work specifically for your project. Our team has industry leading designers and experts that guarantee our customers 100% satisfaction.